March 26, last night our trash barrel got hit by the bear. The bear is up from a short winter hibernation and is hungry! It pushed through a big pile of rose trimmings piled where the bear usually comes on a trail out of the forest behind the houses on our street. I guess we will have to be more careful about tying down the lid with heavy duty bungee cord...as if it was summer already. March 28, they told me at the hardware store the bear had torn the door off my friend's chicken coop and got all her chickens. There were raccoon tracks in the snow next to the car this morning. By afternoon the clouds parted and glorious sun shone down. Bruce and I walked up the street, a little farther this time. March 29, while searching online, I got hacked by a fake redirect "ATT" web pop up. Suddenly everything slowed down, Norton was jammed. I had to turn it off by removing the battery and took it to Acme Computer in Mt Shasta for cleaning. April 1, a pile of broken promises, like a pile of rusting bicycles in Beijing. On today's news Larry Gagosian is the bedouin of the Miami Art Fair. April 2, the phone rings, a voice from India asks a series of personal questions about my computer. I hang up when he directs me to sit in front of the computer and follow his login instructions. When I pick up my little netbook at Acme they tell me this was a complex malware hack using the phone, several people had already reported. April 3, the soil temperature is 60-degrees F (15-celsius) so I planted peas. Transplanted two big pinus parvifolia bonsai/penjing. April 10, rain again, fat fuzzy white clouds float in the canyon all day with chi rain, pink and white cherry blossoms. The apricot has been blooming for weeks, surely we will have a big crop of golden sweetness like fat old gold doubloons. Got some lettuce and kale starts in Redding while we were there for Bruce's check up, doing very well. Now he accompanies me in the big loop from our house up to the bottling company at Hedge Creek Falls Park and then down the other side of the freeway on Dunsmuir avenue past the city park and historic Babe Riuth Ball Park and old train engine, municipal swimming pool before looping around at the old caboose, crossing I-5 and ending up back at our house. Total 1.8 miles (3km). This week's picture album ends with beautiful spring greetings from Eunice in Beijing: "It's Yu Yuan Tan Park（玉渊潭公园）.It's very near the Beijing West Train Station,I attach the map below,the green one is East Gate of Tsing Hua,the red one is the park.It's famous for the cherry blossoms.This year they have the 24th Cherry Blossoms Festival.The tower is the old CCTV tower,the new one is in Chaoyang district（朝阳区）,I also attach the new one below." "I just saw your Novermber 18 Beijing Breakfast Letter, about the unused railway complex question, I baidu the answer,they said it's a test base for the new trains at first, now it's more like a satelite town of 798, a lot of artists rent the warehouses, then walk a few minutes to 798 to sale their paintings. If you like, check this website, I got the information from herehttp://zhidao.baidu.com/question/125452046.html. Eunice is finishing classes and going back home for the spring festival holiday, cutting out of town ahead of the crushing millions of people who travel by train to visit their hometowns for what we call Chinese new years but what they call spring festival. Li Zhang showed some of us about Chinese tea. Three young researchers, two from Italy, one from Spain and myself. She brewed several kinds starting with The Guan Yin, some had grassy, sour, flowery fragrances and special tastes. Li also explained how the different teas were grown or prepared. Mostly and originally prepared only for the empoeror and then monks drank tea to stay awake during long meditation sessions. On Friday Dec 2 it snowed at Tsinghua. I woke to find the hutong under a blanket of white. I got to wear my foul weather cycling gear and to ride my bicycle in an inch of snow which quickly melted in the roads, but remained for days on the roofs and out of the way places. By the next day the sky was clear blue and the sun shone brightly. According to friends in Beijing, I was lucky to fly out on Sunday ahead of a terrible bout of smog which closed the airport Sunday night to Tuesday morning. The US Embassy air quality reading was 'scary bad' 'basically off the chart.' They tell me: enjoy your internet freedom. Last night the outdoor light woke us and I got to see a small brown bear walking around the yard, looking for fruit that have fallen out of the pear and apple trees. Possibly could be one of the two cute baby bear cubs I saw this summer. Outstanding weather, sunny and cold but warm in the afternoon in the sun. Raking leaves and sweeping the porch. Wound up a hose, covered the spigot with a mitten against freezing. We're drinking green tea everyday. November 12 Saturday we travel by subway to China Railroad Museum way on the other side of town inChaoyang district. From the Sanyuanqian Zhan we take a taxi out to a far industrial area. The museum is in an unused railway complex. Maybe a Chinese person reading this can tell us why the big complex is closed and abandoned. Did they build it too far from people? Did heavy industry move to another city? We don't know why this big area is no longer in use. It is great for housing and displaying at least 40 locomotives, passenger and other cars under one huge roof with translucent skylights. Japanese, French, UK, American and Soviet locomotives before 1950, after all Chinese made. In front is a little switcher looking like a little black Thomas engine, heisede Thomas the children call it. Thomas car toys are for sale in the gift shop with Chinese railway collectibles. Art District 798 is on the way back and is a surprise favorite place for Bruce since it is all one huge 1950's factory area given over to artists. Impressive with a lot of western 20's and 30's technology preserved and incorporated into ultra modern glass and masonry structures built in 1990's for trendy architecture and design offices, art studios and galleries. Built by East Germans in 1950s for an electronics factory, it is one of a few Bauhaus examples still existant found around the world. Delicious ham and cheese sandwich with fries and spicy pasta with coffee al fresco in late afternoon sun. 140K $22. Bruce found the mother lode coal loading gantry surrounded by a network of conveyor belts, gas works tank, little pipes with steam condensate clouds, exposed asbestos pipe lagging everywhere. Inside one gallery lit by candles, Tibetan monks were making a big sand painting mandala, scraping metal funnels to jiggle colored pigments out the narrow mouth grain by grain into intricate pattern. Grabbed a taxi and got back to subway station and the long ride home. Sunday we traveled by bullet train to Tianjin the 6th largest city in PRC (People's Republic China) in a beautiful setting on the Hai River near the Bohai Gulf with a beachy climate and clean air the day we visited. Located at the Northern most end of the Grand Canal built in the Sui Dynasty 589-618AD, it has always been an important city. It was also the location of an incident in 1856 when Chinese tried to defeat British and French opium smuggling. At the end of the Second Opium War in 1858 China was forced to open Tianjin to foreign trade (opium trade). And it presently is one of five cities home to the most active Chinese criminal gangs. Western nations have had concessions and garrisons in Tianjin over the previous century and it was occupied by Japanese in 30's until 1945. One of the world's fastest supercomputers is located at the National Supercomputing Center in Tianjin. In 1906 it had the first city-wide tramway system in China. The main railway station was built in 1892 and rebuilt from scratch in 1988. A bonsai friend of mine, Frank Bardella, lived here with his family before immigrating to San Francisco when he was eight years old in 1950. I was excited to find large, in ground Lu Tian Pen Jing Fraxinus hupehensis Chu Shang et Su, Chinese Ash recently transplanted in the plaza in front of the Tianjin Railway Station. Bruce is impressed by the size of the bullet train station in Beijing, called the South Railway Station and is about 16 stops down subway line #4 from Peking University. There is no parking problem, people get there by subway. The impressive stations are huge, cavernous, but beautiful and lit with natural light, many shops and cafes and seating for everyone waiting. Bullet trains are coming and going every 10-15 minutes. Our track was elevated on a raised concrete roadbed from Beijing to Tianjin so things can pass underneath. There are perhaps three classes of seats, coach, business and first class with western style washrooms. There is a snack bar in the center of the train. Coach class has 5 seats across with an aisle in the center. Business class has 4 seats with a center aisle. The seats are built on locking devices which only take a few minutes to turn around, wash all the windows and go the other direction. It costs 55K $8.67 one way for coach to travel 69 miles or 112 kilometers. The train travels 178mph or 287km/h top speed, quietly and smoothly, only taking about 30 minutes. We pass farmland with smokestacks and groups of apartments to protect farms from being eaten up with housing like in the US. Looking at California doing high speed, it will never be able to compete with what the Chinese have done. Our farmers are tying it up with lawsuits and the airplane mafia is unhappy, says Bruce. The Beijing subways have a light board above each door showing the progress of the train. The tracks are sealed off from the people with big glass walls. Two sets of doors at the station platform line up perfectly so people can't fall off the platform onto the tracks. We've been working on high speed rail, spent billions of dollars paying 'experts' to study and going nowhere with it, adds Bruce. November 14 Bruce's last day we started with French Toast at home. Bruce shopped and found German strawberry jam, organic eggs, fab bread. We had lunch at Pizza Hut International, a classy restaurant with full menu of international dishes with Chinese characteristics. We had individual pizzas one shrimp and smoked salmon with mustard sauce and green pepper, the other popcorn shrimp with peppers and onions. French mushroom soup, cappuccino. We were stuffed! Afterwards we biked around Wudaokoulooking for smokestacks and found a gas station, visited my tailor and paid my bill. We ended the day with a full body therapeutic massage in a room for two 360K $57 1 hour. Out the window the bright fall sky lights up leaves falling in big piles on the side of the hutong alley. Magpies swoop through bare poplar branches. Clouds of steam and smoke roil out of a tall smokestack in the near distance. I am planning a 3 week visit to California in December to visit my family. I just learned that Bruce has bladder cancer and will be going in for surgery on December 7. It's getting colder, down to the 40's at night, sunny and nice during the day, if its not windy, high 65-degrees. I'm getting used to it. They had all the gear there, booms, giant reflectors, vans and truck and lots of security. Its a beautiful campus with buildings of all eras, I'm surprised they don't film here more often. Feng and her 9 year old son Alex came over Sunday nite to hua hua with me. We painted lotus and rocks and water falls, practiced lines, cross hatches circles and little guppy fish. I've been rising at 5am, sitting in my favorite chair in the living room looking east I watch the sunrise while drinking hong cha and writing. Zaoshang wo yibian hecha yibian xieshu. Early morning rising before dawn only a faint hint of light in the sky to the east between the business park buildings. Facing the morning, I watch the color stealing through the black tree foliage in the hutong, pink to salmon to dark orange when the reveals in brilliant red gold. Tired golden brown leaves drop one by one off smooth white barked branches of magnolia denudata, leaving fuzzy buds of next year's flowers on the tips. Some leaves are still green, showing burnt brown edges where the sap is slowly draining away. Birds ate all the coral red berry fruit that hung in bunches along the branches all summer. Not much blooming now. I was surprised to see these roses near my office. Although the tag said Rosa chinensis jacq. when I looked it up online it doesn't resemble the pink rose I found there. Friday Dr's Monica and Sharon and I met for lunch. The first time in a long time it seemed. We had a lot to catch up on. Monica works in a key national laboratory. On the door of the building it says: Tsinghua National Laboratory for Information Science and Technology. She is a research scientist studying DNA. For fun I took a picture on the door to my office: Office of Overseas Promotion. It's getting colder, foggy/smoggy, heavy mist almost like rain. The melodious sound of a Chinese flute floated over the brown spent lotus foliage of the lotus pond shui mu qing hua. Workers are chipping bricks from a demolition project adjacent to the road and sewer work in our neighborhood. Saturday Li and Eunice came to my apartment for another painting party. They are pictured next to their first huahua. One thing I like to draw and paint are the grotesque rocks used to decorate the landscape here at Tsinghua, and other places. Many of the finest come from Tai Lake in Jiangsu Province. There are many accounts of emperors ordering fantastic rocks be delivered to the capitol. Men lost life and risked much to bring them in the old days. If you were the captain in of a rock delivery that fell into a schism you would run for the hills and become a bandit before returning in disgrace to the capitol. This particular rock is in a small park between my office and the little coffee cafe I like. 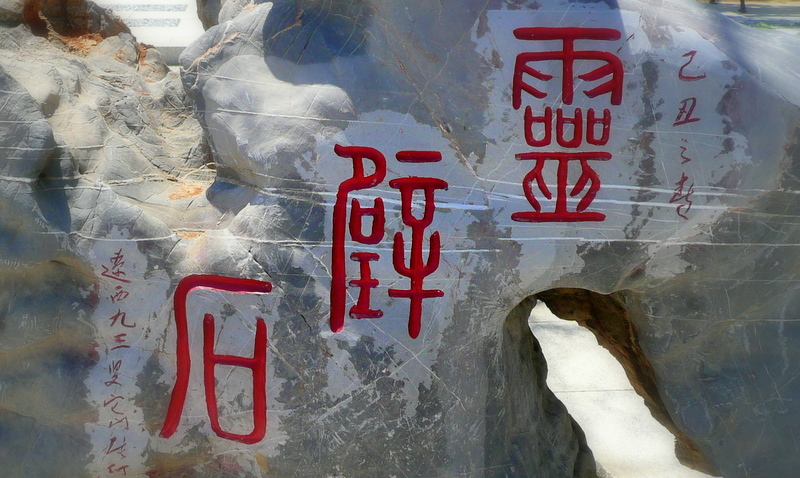 It has a marker rock that says: "TAIHU SHI"(太湖石). I brought my camera with me downtown to language class. I want to get pix of the colorful street life in the upscale neighborhood. The breakfast cafes and stands are doing brisk business in the early hours. Pancake or Beijing pizza atTu Jia Jiang Xiang Bing. Steamed buns -baozi - come with a variety of fillings -zheshi shenme xianr de baozi? My teacher WuDan Laoshi happens to walk into my picture frame. Her favorite filling isnai huang bao - steamed creamy custard bun. On the subway I see some young men with these ENORMOUS packs get on in front of me. They pose for this picture. The subway car shakes, sorry about the focus. If you look carefully at the Penjing balcony image you will see a penjing on the right side. Wandering in and out of side streets back to the subway station I see some very exclusive dress shops and interesting people. The National Holiday - Shi Yi (10/1) - has come and gone since I last wrote, from October 1 to 9. Everyone is going out of town on holiday except Cher, it seems. I'm looking forward to some quiet time I can paint uninterrupted. One day it's warm and sunny, the next cool and hazy. Casual summer dress and lifestyle is over, fall is blowing bits of yellow leaves onto the green mondo grass by my office. The ginkgos are the first to color. In the warm afternoons I pack up my little folding chair, zipper portfolio, bag of art stuff and pedal around, looking for a nice scene. Lots of trees in rows with road or sidewalk feature. Kind of impressionistic VanGogh-esque, French looking to my eye. I try to improve my Chinese brush technique, adding some color. When the poplars turn gold I'll try some plein air in oils since I shipped my easel, tubes and brushes this summer. The holiday starts off with a trip to art district 798. This time I go with some young students from Beijing foreign Language University. Two boys and two girls. They all speak good English. The subway ride is long and we have to transfer once. We then take two taxis (Beijing regulations, only 3 people in back seat, they have cameras on the overpasses our taxi driver explains) to the district. Only cost 14K ($2.21). The subway is 1K or less if you have a subway card which I do. We finally made it and stay all day, have lunch and dinner there, before the long trek home. It is fun, talking art and looking at some 'good,' some not so 'good,' some really 'good' art and then of course the people watching. I like one exhibit so much I bought the book and have been wondering if it's possible to meet the artist. Some little oil sketches from LA area beaches, palm trees, make me a little nostalgic for the old LA art scene. The next day I am up early. James the cab driver picks me up at 7am. We drive about a half a block to a tiny canteen where he has a quick breakfast. We next drive across campus to pick up Li Zhang - young research assistant - who is my interpreter and photographer at the Beijing Botanical Garden - Da Guan Yin. Li and I had lunch at the garden over-looking the ancient palace lake. Li is an expert at Chinese cuisine. She orders for us mushroom shrimp soup which comes in a hammered brass tureen over a flame, little yeast raised buns with chopped green onion,qieza (eggplant), maopo dofu, and rice. After drying some teas go through the added processes of roasting and scenting. Tieguanyin is one of the names of the adored Chinese Boddhisattva who has been influencing Buddhism in south Asia nations for centuries. The name of the Chinese tea is translated in English as "Iron Guanyin", and sometimes as "Iron Goddess of Mercy." My deadline for the Golden State Bonsai Federation magazine Golden Statements is on Wednesday, so I only have two days to finish my article. 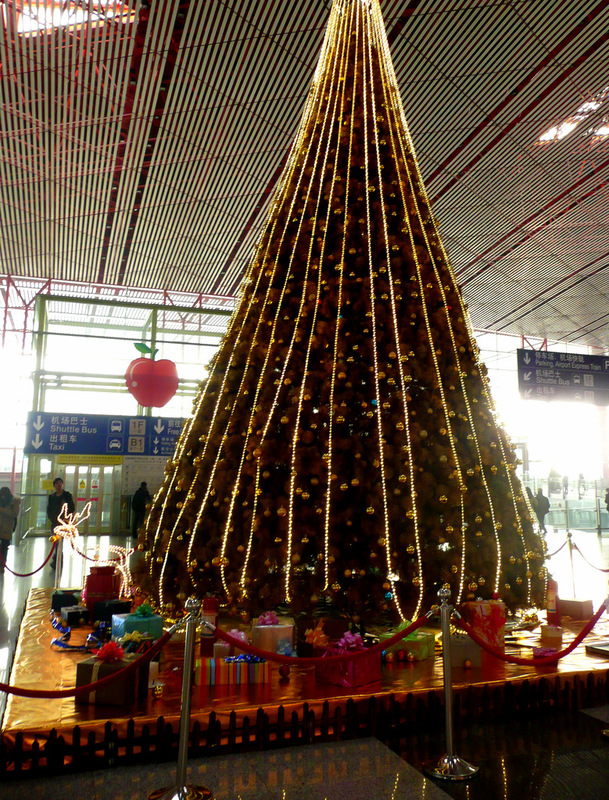 This is my second Penjing article. The first is of the Shanghai Botanical Garden Penjing collection in March. At last I send off the article with several of Li's hi dpi images and am able to think about painting. They continue to tear up streets around my neighborhood. One day you will leave the house one way only to return to find barricades up and a giant ditch where you used to go! I discover little paths and alleys through the hutong I never would have. When will we get back to normal??? Dishes were served with small bowls of rice cooked with diced purple potato, which made it a lavender color, and Yu tou or taro root, Chinese potato and small bowls of mushroom soup mogu tang. Just as we were sitting down to sample Li's creations (Sara and Cher were sou chefs, prepping, cleaning, chopping) and toasting with the liwu de yiping butao de honse de jiu, Evelyn, a new neighbor on the 2nd floor, rapped at my door bearing a plate of rhambutan fruit. Evelyn is visiting professor form Brown University in Rhode Islandhttp://www.brown.edu/, lecturing in the anthropology department. She speaks very good Mandarin. Founded in 1764, Brown University is the 7th oldest college in the United States with a current student enrollment of 8,000. My internet was out, the entire southwest neighborhood, for some 'unknown' reason. I changed the duvet on my bed to the winter weight, fluffy one and washed the cover in my tiny washing machine and hung it to dry on the little sun porch. This week Evelyn and I went to a fancy hotel downtown in the Chaoyang district to attend a lecture by a Tsinghua factulty director form the School of Economics and Management. After a lengthy presentation about the Tsinghua INSEAD dual degree program (in only 18 months you too can pay $90K and receive an MA from TU and one from INSEAD). The second half of the night's program was on "Challenges of the Chinese Economy and the 12th 5-year Plan." Before everything started we were treated to espresso and darling miniature current muffins as big as a quarter and the cutest little custards in porcelain dishes about the size of a large spoon, each with a couple tiny blueberries and little crumb of praline. Delicious! Everyone was networking like crazy, and it was big fun. The current rate of growth being experienced by China today is unsustainable. This is something known by the architects of the 12th 5-year Plan (2011-2015) who point out several problems but don't offer any solutions. o party officials' salaries increase at the CPI rate annually, resulting in highly compensated bureaucratic officials. o The private to the public ratio shall never exceed 50%, currently at 50%, what happens if private sector growth exceeds to 51%? State Owned Enterprises (SOEs) are used to balance many conditions since they are 100% under the control of the government such as employment and investment. Currently SOEs are starting merger operations with private entities which preserves the SOEs hegemony. The current growth trend started in 1978 when Deng Xiaopeng was recruited out of exile. He instituted agricultural and industrial reforms to counter the disastrous results of Mao's Great Leap Forward (1958-1962) and Cultural Revolution (1966-1976). Mao's official tenure 1943-1976, died 1976.
o In 1967 Liu and his wife were under house arrest in Beijing and disappeared. In 1969 Deng was sent to Xinjian County Tractor Factory. Both men attempted to remove Mao from power and rectify many problems with the country. The Cultural Revolution was a method to combat Mao's growing numbers of critics and regain control of the country. There are many technical aspects to the net trade income, the tole of the central band, money supply and Value Added Tax which I can't delve into here, but are fascinating. The lecture provided me with greater understanding of the current situation and some interesting details, all delivered succinctly and with humor. This past weekend I spent a blissful afternoon at the little square park near the office with the big grotesque rock and antique planter. I sat in the hazy autumn sunshine and drew the big rock. Part of my WuWei (non-action) series I am developing. Little bits of bamboo in the background and wispy clouds indicated by a few lines. Next I brush painted the little umbrella trees and their bigger maple companions. This will be beautiful when the leaves turn color. The Sophora japonica 'pendula' is also known as Pendulous Pagoda Tree or Weeping Scholar Tree. A weeping head is grafted onto and upright trunk. Creamy yellow pea-like flowers bloom in summer in large panicles. The Chinese maple, Acer discolor, is very similar to the Japanese maple, Acer palmatum. My internet and Gmail have been going in and out since Thursday when I accidentally triggered something while researching articles for my bi-weekly media report. I don't even want to tell you what keyword started it this time. The mornings are crisp now. The guard shack ladies were admiring the little pots of ornamental peppers, poking up purple and red in the sun. They are tearing up the main road in my neighborhood, the one that goes by the shopping street Zhao Lan Yuan, down to the Senior Center and Primary School, where it flooded during the one-day typhoon event. On any morning on my way to work I pass the old 'playground' of Tsinghua, now used mostly for soccer. Many folks are out in the morning of all ages from toddlers to seniors, enjoying the fine fall weather. I saw a boy on his bicycle riding furiously around and around the track trailing behind him a string of kites. Darling! Because of the road construction, residents in my neighborhood have had to find new ways to come and go. 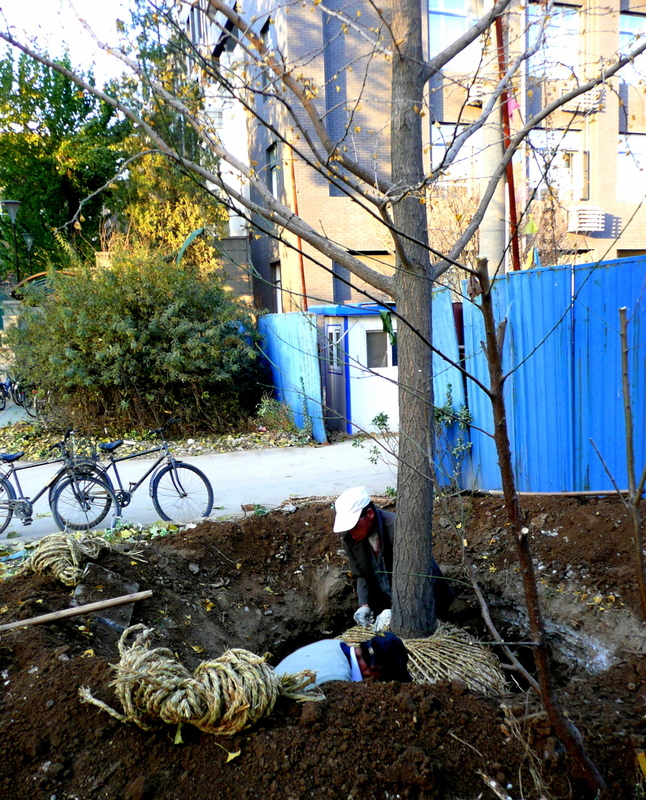 I am sharing some pictures from the hutong. [audio mp3="http://cherylpetty.com/wp-content/uploads/2013/10/月亮代表我的心.mp3"][/audio] Shortly after returning to Beijing, I went out to dinner with Yun and Yun and son to my favorite neighborhood restaurant. Wo hui Beijing yihou, wo qu yu Yun, Yun he erzi zuixiai de linli canting. We had chao fan -- fried rice Beijing style which is verylightly fried with peas and bits of scrambled egg, shala -- lettuce salad with cherry tomatoes, peanuts and bits of other greens, stir fried mushrooms and cabbage with lotus seed and water chestnut, and fried corn cakes cut into wedges and sprinkled with sugar. Wode chi chaofan, shala, mogu lianzi he ling jiao fan chao he bai cai. Around 9pm, after relaxing at the table, we walked across the big highway Chendulu on the overhead pedestrian walkway to the massage clinic where Yun and I first met. We all got a massage while their son, James, watched cartoons. What a nice way to end the evening around 10pm. The next morning I managed to get up and out the door by 9am. My plan was to Chinese brush paint at the lotus pond on campus. Wo dasuan shi zai xiao yuan lide zai he hua chi, hua hua. Besides having many curious on-lookers, I completed four sketches of the lotus leaves, he ye, water, shui,reflections, dao ying, pavilion, tingzi he,willow trees, liu shu, and water skimmers,gerris gibbifer (latin). Later Li Zhang came by my apartment to visit. This bright and accomplished young woman is research assistant to one of my ex-pat girlfriends, Sara, who is conducting research on anthropological economics, specifically the migrant girls working in the downtown market area. Later we had dinner at my favorite restaurant, and now I can tell you the name. Man Pen Xiang Shui Zhu Yu,Full Bowl Fragrant Boiled Fish, specializes in Sichuan style dishes cooked in an oil/water mixture with Chinese spices and chile pepper. The longan is very similar to the lychee, also called Dragon's eye, with a hard, smooth, light brown outer shell, inside is a soft, juicy fruit like a grape with one large black seed. Great quantities of longan are imported to Beijing from Thailand. I see from looking online that the University of California is working on cultivation of these fruit, but they find it difficult for several reasons. Although not a picky as lychee as far as temperature, longans must be propagated by marcottage-- air layering-- and they have trouble inducing fruiting since California is an arid climate unlike monsoonal Thailand. Over the weekend, my Puji apartment was the location for a cooking party. Shange zhomo wo de Puji gongyu de pengren dang. Bruce and Jerry are buddies from Shanxi province, and ZhiWei is a new friend of theirs in Beijing. A mountainous area and a major coal, iron and electric power production region.http://www.drben.net/ChinaReport/Shanxi_Province/Shanxi_Province-Index.html Shanxi is also filled with significant cultural heritage sites, including the Yungang Cloud Ridge Caves.http://en.wikipedia.org/wiki/Datong . I met Bruce at the lotus pond at Tsinghua while I was brush painting. 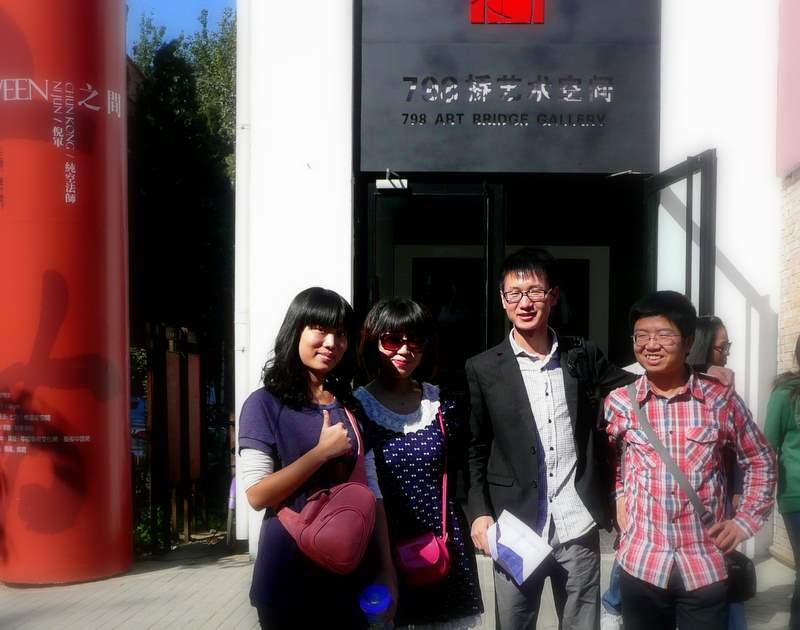 He is here in Beijing doing an internship year at Beijing University in the Total Immersion Program (TIP) http://www.tip.org.cn/ in co-operation with the State Foreign Expert Bureau, Federal Education Department and Foreign Language Teaching and Research Press. He is an instructor in the program and is called LaoLi or Teacher Li. He will be taking his final exam in January at Shanxi Agricultural University founded 1907http://www1.sxau.edu.cn/foreign/ejianjie.htmwhere he will graduate with a BS degree in molecular biology. Click onhttp://blog.sina.com.cn/actionslee to see Bruce's blog. Jerry is in graduate school at Beijing Language and Culture University, studying to be an English teacher. Here is his school link and class schedule. http://www.blcu.edu.cn/blcuweb/english/index-en.asp ; Intercultural communication, Classical literature, Modern Chinese, English, Chinese composition, Teaching investigation and case analysis, Second language teaching, Chinese art and history, Linguistics and Chinese political system. Jerry sent me the attached mp3 called "Yue Liang Dai Biao Wo De Xin" "The Moon is like my Heart" and I thought I would share it with you. I thought the melody sounded a little like Debbie Reynolds singing "Tammy." ZhiWei is working at ChinaLife. ZhiWei's company http://www.chinalife.com.cn/publish/English/356/index.html/ . ZhiWei's parents have a restaurant back in Shanxi. We feasted on dishes meticulously prepared by the young men. There was Hong shao quieziShanxi sweet eggplant fried with onion, sugar and fish sauce followed by Xi Hong shi chao zi dan stir fried tomato and eggs seasoned with salt, pepper berry and garlic.. Lastly,Da zha hui veggie medley with fu zhu dried bean curd sheet, la jiao red pepper, lu dou jiao green beans.mogu mushroom. I have included a jpg of Wu Dan, my language teacher at That's Mandarin. http://www.thatsmandarin.com/ When I started 4 months ago, Mr Monica and I were going to nearby Wudaokou but suddenly they announced the classes were being consolidated with another campus near Dongmenzhan in the old downtown of Beijing. Now we get up on Saturday at 6am and take the subway, grab some interesting breakfast on the sidewalk on the way to TM, arriving by 8am. Meige xingqiliu wo dou zai That's Mandarin. Meige xingqiliu wo dou shang hanyu ke. Ni lai TM fangbian ma? Xiayu de shihou wo buzhidao fan bu fangbian. Is it convenient to come to TM? When it is raining, I don't know how convenient it will be. This weekend was the Mid Autumn Festival or Moon Festival, Zhongiu, a 3,000 year old asian moon worship rite originating in the Shang Dynasty 16-11th century BCE. It coincides with the autumnal equinox when the moon is at its fullest. Traditional food, the mooncake, comes in many varieties. Being a legal holiday, we get a 3-day holiday and will return to work on Tuesday. Similar to our American Thanksgiving, farmers celebrate the end of the fall harvest and is a traditional time for families to come together and share a meal. The young men from Shanxi wanted to invite me to celebrate with them, all of us being far away from family. We went to Grandma's Kitchen on the 5th floor of Hualian mall. Wode qu Grandma's Kitchen, hualian shangchang di 5 ceng. ZhiWei was stuck in rain for 1/2 hour and couldn't get a cab. A friend of Jerry's, Helen, joined us. She is also studying to be an English teacher. The menu at Grandma's is mostly American. I ordered French Fries and a Corona, Helen tried a Quesadilla with salsa, Jerry and Bruce had strawberry and pineapple ice cream sundaes with mooncakes and chocolates. We talked about movies and music, Chinese and American customs. Afterwards we went to the 1st floor -- shoes -- where they helped me find a sensible pair of shoes for the fall season, flat heeled short boots good for bicycling and subway travel in the rain. Later we all walked the short distance to Jerry's school. It stopped raining. Jintian xiayule danshi xianzai buxia le. The Beijing Language and Culture University, founded in 1962, has 20,000 students at its small campus next to Tsinghua University. You can compare this to Yale Universit It has a darling, intimate lotus pond and wall with the names in Chinese of all the countries from which students have come to study here, 175. I got home before dark. Many people have asked why I don't use web hosting for my blog. One reason is that this way I am avoiding increased scrutiny from dage, Big Brother. Another reason is that I want to keep control over the content. I am happy to have you forward these emails to your friends, and add anyone who sends me an email asking to be on the distribution list. There is a possibility that I will want to use them for future projects after my return to the US, and I want to retain my copyright ownership. If I published them on the world wide web that would be nearly impossible. Thank you for your understanding. The past couple of weeks have seen freshmen appearing on campus, opening bank accounts and buying phone service in large numbers-- a shock to us locals trying to go about and do our business. Lines of brand new bicycles appear outside buildings that have been empty during summer break. Squads of them dressed in camouflage fatigues are marched around campus. Our office participated in creating the word T-S-I-N-G-H-U-A spelled out by freshmen wearing shirts in the school colors. Soon classes will begin. Taiji Ball, sounds just like Tai Chi Ball, is a traditional sport which one person can play using a variety of balls. The version pictured here uses a tennis ball sized ball, with or without feather tail, and a racquet. The idea is to control the ball while moving arms and legs around, over and under, without letting it drop to the ground. Here's a cool link to videos of several of these sports thanks to Hong Feng. Hua Jiao, Sichuan pepper also called pepper bush, Chinese Prickley-ash and Zanthoxylum simulans is grown as a landscape shrub near the apartments in my neighborhood. It belongs to the 'warm the interior' class of Chinese medicinal herbs used to treat internal cold syndromes such as a deficiency of yang. Only the outer husk of the 3-4mm berry that splits open to release black shiny seeds is used. Although called 'pepper' it is not related. It is used in Sichuan cuisine and also important in Tibetan, Bhutanese and Nepalese cuisine since few spices grow in those mountainous countries. I was lucky to get this image of a grandmother holding her granddaughter over a tree well in the sidewalk as the baby pees. This is the norm in China, and it works very well to train the children. Pants are split at the crotch and the caregiver gently holds the child in a squat where they can pee, in the toilet or on the side of the road, and softly whistles a pee song. Chinese children are toilet trained in this way at 6-7 months old, but must have assistance. This week's blog is in two parts. Part I features the Forbidden City with many pix of Palace Museum treasures and a few palace ladies.For my Chinese friends, Mandarin will be in bold. At noon on Friday, I met Li and Emily at the west gate. Shang zhou wu zhongwu, wo yu jianle Li he Emily zai ximen. Where we parked our bicycles is close to the subway station. Women tingfang zixingche. Ta li ditiezhan hen jin. We take #4 line to Fuxingmen Station. Women zuo #4 haoxian qu Fuxingmen zhan. And then transfer to #1 line. Ranhou women huan #1 haoxian. After two stops, we arrive at Tian'anmen East. Liangge zhan yihou, women daole Tian'anmen Dong zhan. The Forbidden City, Zijin Cheng, (built 1406-1420) is rectangualr in shape and oriented on a north/south axis, surrounded by high walls and a most, the FC is the world's largest palace complex. Factoids: 960m (3150-feet) NtoS, 750m (2460-feet) EtoW, 720,000-square meters (2,362,204-square feet or 447-square miles); the moat is 6m (20-feet) deep, 52m (170-feet) wide; the outer wall is 10m (33-feet) high and 3400m (11,150-feet or 7-miles) long. Inside there are 5 halls, 17 palaces, 9,999 rooms, nine being a lucky number for the emperor. I'm telling you all this to help you appreciate that we walked approximately 5610m or 3.5 miles within the FC complex, add on to that another .5 to .75 to and from the subway on both ends. So totally we walked at least 4 miles that day! Women wanquan zouliao 4 yingli di na yitian! The southern section contains the 'outer court' QianChao with five ceremonial halls. The northern section contains the 'inner court' HouQin where the emperor lived and worked with his concubines, eunuchs and servants. The buildings have beautiful glazed tile roofs. The roof ridges are now protected by lightning rods. At the roof corners, small figures protect the building: immortal riding a phoenix followed by a dragon, phoenix, lion, horse, sea horse, a number of mythical creatures and a LiWen at the top end. First, we visited the Porcelain collection in the Imperial Garden, YuHuaYuan, and then we wanted to see the big jade. Women xian canguanle huangjia yuanlin. Ta shi porcelaine shouji. Ranhou women yao kan dao de dayu. The Song Dynasty was a period of unrivaled development of arts. Many rare and precious specimens of all dynasties are displayed and protected at the national Palace Museum as China's cultural heritage and proof of legitimacy for rulers of all ages, proof of ownership of the symbols of China are equivalent to proof of embodiment of China. An example of the rareness of some of the great Chinese antiquities to be found here is the 'Ruware' from Henan province. The location of the site of the kilns is near modern Baofeng Qingliangsi and was recently identified in 1986. Luxury crafts patronized by the nearby court at Kaifeng stimulated the emergence of several technologically innovative kiln manufacturers. Ruware is most highly prized in later times because of the relatively short period of production. Only operational over a 40-year period, the kiln ceased production with the 'disaster of 1126.' Fewer than 100 complete pieces are know to exist today. 'Yu the Great Taming the Waters' 1787ce Qing Dynasty, is the largest carved jade in existence. The original boulder was 2.24m (7-feet) high and 5330kg (11,726-pounds or 5.6 tons) and was discovered in the western area near Khotan. Khotan was an ancient Buddhist city on the Silk Road near the Taklamakan Desert. Built on an oasis, its mulberry trees produced silk for export as well as nephrite jade. Legend is that a Chinese princess brought silkworm eggs in her elaborate hairdo when she was sent to marry a Khotanese king. Khotan was the first place outside China to cultivate silk. It took 3 years to transport the big jade to Beijing on a wagon drawn by 100 horses and requiring 1,000 laborors for road and bridge construction. The jade boulder and two full-size wax and wooden models, approved by the Emperor in 1781, were sent by boat south to Yangzhou where specialized jade craftsmen took almost 8 years to complete, 150,000 working days, and returned to the palace in Beijing in 1787. Everywhere I went the price was less than the tag. First time I've experienced Chinese refusing my money! Well maybe not everywhere. Cute black slippers with flower on toe: Y300-51=Y249 at Hotwind ($46-7.85=$38); Peach colored taohongse straw cloche hat maozi, actually small enough to fit my head, Y55 ($8.46); Polo bag, huge enough to carry my camera tripods at 20-inches, priced at Y1200 ($184) sold to me for Y224 ($34)!! Last purchase at little shop with loud teenage music on the big avenue ChenFuLu Kama Classics, pink chinos Y180-90=Y90 ($27-13.85). By now I feel ludicrous with all the shopping bags hanging off the handlebars, still I manage to ride back to the apartment, stopping for lunch, wufan, at my favorite neighborhood restaurant, the one with the live fish. Now that I can speak a little Chinese, things go smoother right from the start. I can tell them, 1 person, using the right measure word, yiwei. I learned how to order what I like, mifan, qiezi he mapo doufu--weila--rice, eggplant and mapo tofu--not too spicy. The fuwuyuan brought me tea in a glass like chrysanthemum flowers with big orange seeds and a little bowl of rock sugar. When I get low I add hot water from the tea pot. Delicious. I had breakfast at a tiny canteen inside an apartment complex near my bicycle repairman with Dr Monica who is a regular there. I had something that looked like a soft taco with fresh lettuce. Dr M had a little flat bread with sesame seeds sliced open with a fried egg inside. We both had fresh, slightly warm soy milk in sealed plastic cups you pierce with a little straw to drink. Y9 ($1.38). People are friendly in this little staff canteen. We got into a conversation with one fellow who called himself an 'intern student' which we didn't understand. He had questions about the US educational system. We agreed both the US and Chinese systems used a nationwide standardized entrance exam (GaoKao/SAT). Beyond that, there are many differences. I think the biggest difference is that in the US the student gets to choose where they go and what they study. If I had been told that I tested well for chemistry, and that was going to be my major, I would have acted out. How does that affect your love of learning? Many Chinese I meet express a desire to immigrate. In fact of all the Chinese students who go overseas to study only one-third return. That's got to be a severe brain drain for the country. They are even discussing issuing US green cards to all Chinese students just to simplify the process. To give you an idea of the process to get a US visa as an adult--not a student--you have to prove you have real estate and family ties in China for you to return to. Getting out, with your family and assets, well, its pretty difficult. So, why do so many Chinese want this? The answer I get is 'freedom.' I've given this a lot of thought. Life seems pretty good here. Especially if you have real estate and a good job. There are many opportunities that I can see. The government doesn't interfere in a lot of ways that it does in the US. Gradually I've concluded that the 'freedom' to choose your own path and the 'freedom' to access information is what lures people. We have a variety of career paths in the US to get to various career endpoints. But here there is one path through the GaoKao, the best test takers get to go to the best colleges which have a direct path to a career endpoint. The Gates path equivalent, those who drop out of college and go on to shape their world on their own terms doesn't exist here. Once you drop out you are stuck in a societal hierarchy with few options. The freedom of many options, that's what it is, and the freedom to make an informed choice. There are 31 named species of hydrangea native to China. This one blooming on campus near my office has the bloom of a paniculata but on a short bush only 1 meter tall. The lotus garden at Tsinghua is an ethereal delight. Nelumbo nucifera is NOT to be confused with waterlily, Nymphaea, an entirely different plant lacking the distinctive central spool shape that forms the seed pod. Waterlilies come in a variety of colors while lotus are white to hot pink, taohongse (literally: peach-red). "One who performs his duty without attachment, surrendering the results unto the supreme Lord, is unaffected by sinful action, as the lotus is untouched by water." Bhagavad Gita. It's final, I will be visiting Dunsmuir this summer, July 27 to August 16! The end of the term is fast approaching. Suddenly I am very busy proofing articles for the next campus newsletter. It comes out 3x and is a 4-color glossy journal produced in English by our department. Other projects suddenly are phasing into the final stages, and all are needing proofing by the foreign expert in English. Every two weeks I search various international news outlets like Businessweek and Reuters for mention of Tsinghua. I found a nice bit about all the US patents granted this year. I think IBM had the most, over 500, and among universities Berkeley was #1 with just under 200. Tsinghua was right up there in the top 10 universities. So we made an article out of that for the newsletter/journal. At the anmo clinic, I met a delightful and beautiful young woman busying herself with the tea set and who poured me these tiny little fluted porcelain thimbles of tea. Jasmine is the most popular kind in Beijing, hua cha. She had an art book in her lap and that led to exchanging cards and attempts to talk, her in Mandarin, me with a few pitiful phrases alternating with English. But the main ideas were clearly communicated. I wanted to see her studio, and we both wanted to check each others websites to see what kind of art the other did. http://www.qiuyunart.com/ She is pretty accomplished in Chinese brush painting, hua zhongguo hua. She, QIU Yun, and her husband PEI Yunzhang, picked me up in her Honda. They took me to her studio in a nice apartment building which they bought and finished the interior themselves. It's huge with several rooms and a couple little East facing balconies. She also paints in oils with a spiritual Buddhist theme. They, Yun and Yun, are Tibetan Buddhists which also means they are vegetarian and don't drink. We later went out to eat at a tony 'Natural Vegetarian' restaurant. For you foodies: we had cone-shaped nori wraps with lettuce, slivered pear and some other things, a vegetable stew with yellow squash and something purple cubed, little tofurkey sausages with Chinese katsup and powdered cumin dipping sauce, big communal plate of lightly seasoned escarole piled up high with cubed pickled something red and orange on the side, veggie pot stickers presented under a puffy paper thin rice batter crepe, and braised tofu slices. The next day, on Sunday, xingqi tian, we went shopping for Cheryl's art supplies. We went downtown near the big Art Academy which is surrounded by little art shops where I got brushes and tubes of water base tube colors. wo maile huabi he yanliao. BTW Yunzhang works at Google, yes there is a Google office still in Beijing at the Tsinghua (TUS Park) Science Park. He is 38-years-old, slightly older than my son. They have a 9-year-old son and live two buildings away from me with his mother and grandmother who is 90. I went downstairs to do a little photography and happened to catch some big equipment squeeze through the gate, a big front loader and two big dump trucks. So I guess they don't use manpower for everything. The migrant men were off for the day, xiaban, eating their ramen noodles and drinking beer next to the little minimart. They are friendly, not shy about the camera. Clean clothes. Decent, hard working guys with families back home, far away. Listening to some sets of Steely Dan made me think about the 80s in LA and my old friends and life at Cooke's Crating, living in a warehouse in downtown LA with other young artists. Steely Dan captured the whole LA scene, cocaine, yearning for fame, living life with art and music and disillusionment. Where is Rick Cox now? The talented studio musician and the coke whores Genisse and Sarah? I saw Chas on a demo video online doing the same ambient music awhile back. He still lives in the same house we lived in Sherman Oaks. Lisa with the green hair and Heather, Jame's favorite babysitter? I got my first computer job back then, working for Walter Bilofsky in the Union Bank building on Ventura Boulevard. Today Yun and Yunzhang came over with their son James to give me a little Chinese painting hua zhongguo hua lesson and have dinner. Afterward we all got into Yun's car and drove to the TusPark complex where Yunzhang works. At the lower level are some little shops where Yun introduced me to a young woman who is a tailor. She is making up some things for me. My internet connection was down for 24 hours again this weekend. Zhoumo wode diannao bukeyi shangwang le. Monday was my last anmo treatment. My shoulder is pretty nearly straight, and my foot is back to normal. I got acupuncture needle treatment in my hand and foot. More excruciating massage of abdomen and legs, but the painful pressure points in my arms and shoulders have diminished, so I guess the treatment is working. I went downtown for the last time to pick up the residence permit in my passport. This will be good until the end of my work contract at Tsinghua, in March 2012. I have been carrying on with the massage. After the initial 2.5 hour marathon, my appointments are only 1 hour twice a week, for 180Y each or $27. And the masseur, anmoshi, is lighter in his touch. I suppose the first time is to soften you up and that step was the most rigorous. Now he goes in with surgical precision, delving into the deep pressure points. More than once he asked if my heart was ok, or if I was feeling pounding in my heart by making a heart shape with his fingers and holding it to his chest or making a pounding gesture there. He keenly watches my eyes for every response. More ear checking, at times running around the table to check my pulse and tongue. I wish I knew the science of this medicine. The organs get massaged also, not just muscles and pressure points. Language here is going through a transformation as is the culture. How do I know this? I studied Mandarin only briefly at UCLA in the 70s, but a few phrases persisted. One was 'wo bu hui shuo Zhongguo hua' or 'I can't speak Chinese.' Now you say wo bu hui shuo hanyu. It's been shortened. Another example is 'bathroom.' I learned nu cesuo from the Mandarin immersian cds I studied in January. Well, that's like saying 'water closet!' No one uses the term anymore, and young people have never heard it. No wonder I got blank stares whenever I tried to find the bathroom. Now you say xi shuo jian 'hand washing room,' slightly shorter. Not just vocabulary is shortening, but sentence structure is changing, and the use of English terms is now ok. And that's how they are talking Mandarin in Beijing today. On a practical level, now that it's hot in the afternoons, I like iced coffee-- kafei bing jia nai he tang-- with milk and sugar. It comes in a tall glass with ice and only 13Y or $2.00. Now I can order in Chinese I get fewer surprises, and I get what I want! Walking down the hall, I heard odd sounds coming from the other office. Song had her 6-year-old son at the office, and he was amusing himself like little boys everywhere, playing a game with a few leggo pieces and a small transformer bot. I introduced myself, 'wo shi Cheryl. what's your name?' I asked in English. He piped up with 'Johnny.' So at 6 years he knew what I was asking, and he responded with the English name his teacher has given him. His mother says he's been studying English for 3 years, since he was 3. After 10 years of drought, China is now having the worst rain and flooding in 20 years they say. Mostly in the Yangtse basin, but also where it empties into the China Sea at Shanghai. Finally we are getting a taste of it here in Bejing. I noticed people leaving the building early last Thursday. By 4pm the sky got dark as dusk, streetlights were on and car headlights could be seen through the pelting rain. The wind was blowing the rain sideways and gusting in the trees wildly thrashing. By 5pm there was a lull. I was ready. I jumped on my bicycle, grasping the umbrella in left hand, I maneuvered through the sparse traffic towards home. As I crossed the ancient canal I was surprised to see it had risen about six feet or 2m from puddle of a rivulet to a turbid and swift river. A worker was struggling with a big iron grate. Riding slowly through the quad I tried to keep my feet dry through the giant puddles. I could see where the greens keepers had quit cutting the grass half way across the big lawn. The annoying peddlers had packed up their bazaar near the old gate, and water was running swiftly along the edge of the street under ice cream cases, covered tables and collapsed umbrellas. The closer I got to the hutong the more frequent were gushing drain pipes, creating giant puddles or diverting brick lined ditches. Near the Senior Center the whole street was full of water six inches deep. Hopeless to keep the shoes dry. My only thought was to get home before I got drenched like the other night. At Qinqi massage the pain intensity has been reducing with each appointment-- only momentary bursts of of transcendental awareness through 'tang.' Liujun the 'anmoshi' masseur fetched a basket of bottles and packages. He selected a paper packet, tore it open and produced some long thin acupuncture needles and inserted them into my left wrist and right calf, behind the knee. These stayed in about a half an hour as he carried on with the treatment. I couldn't feel them at all. Odd, looking at them hanging out but no sensation there. On Saturday I got a visit from Ms Feng from the housing department. She came with a workman to check the windows in my apartment where I got a minor flood during the big storm, came right through closed windows and made a big puddle on the floor. Figure that one out. A flood on the 5th floor. Over a cup of jasmine tea 'yige bei huacha' I showed her Luijun's prescription, and she was able to tell me I'm to drink the juice of a winter melon. ok, I think I can do that. I went to the farmers market and showed them the characters for winter melon and brought it home, cut it up and simmered it until it melted into a soupy stew. I strained it and drank the juice-- not to bad 'bu tai huai'-- almost sweet with a light squash flavor. This is supposed to help with the foot. My cabdriver friend James was robbed this week. Someone snuck into his room while he was hanging out his shirts and pants he washes by hand. Carelessly he had left his door ajar. Still, petty crime is almost non-existent as we know it in the west. The Chinese people are very honest and disinterested in taking what is not theirs. I happened meet James in the street the morning after the theft. His eyes were red and swollen and he was distracted and agitated. I urged him to report this to the police, but his landlord urged him not to. Well, obviously, the landlord knows something and may be protecting the thief, someone nearby who could spy on James' movements undetected in a tiny walled courtyard. It does no good to mention I had told him weeks ago to open a bank account and deposit his cash somewhere safe. The weather has made a decided shift to humid after a long dry and sometimes windy winter. Different from where I come from with most of the precipitation in winter in the form of rain and snow followed by a long, dry and hot summer. I love the dramatic thunderstorms with lightning, thunder and pouring rain, sometimes blowing in through the open windows. I was out the other night. While finishing dinner we could hear thunder. This had not been predicted on the Beijing weather-by-the-hour. I'm learning that the weather can change suddenly here. I ended up riding my bicycle the several blocks home in the rain. I haven't gotten the hang of riding my bike with an umbrella in one hand. Will have to learn that one if I don't want to get soaked again. It's the Mary Poppins style, floating over the hutong rooftops. I will say this, my hair loves the rain water rinse! At the coffee shop (kafei ting) on break this afternoon I saw a woman walk up, and she didn't look Chinese. I gave her a big smile as she passed and went into the shop. A few minutes later she came out to the patio and greeted me. Turns out she's Italian from Milan, Guiseppina (Pina) Merchionne. We sat and sipped coffee, finally we exchanged info by calling each others cell phones (shuoji) and got into our phone books. Friday night Pina and a darling student of hers, Elena who teaches fashion in the Art Institute here, brought fresh tomatoes, garlic, Spanish olive oil and Italian pasta. We drank Chines beer while Pina and Elena took over my tiny kitchenette. Pina is working up a proposal to start Italian conservation classes at Tsinghua. She tells me no University or college in all of China teaches art conservation or preservation. Shes working on a glossary of conservation terms from Italian to English to Chinese. I am very happy to have met, finally, someone my age. Sadly, she returns to Milan at the end of the month. Enjoy some images from the campus art show. Cynical realism, contemporary Chinese art movement, is seen in many of the pieces in the Tsinghua University Art Department graduating seniors' projects exhibit this June 2011. The movement began in Beijing, and it is fitting that some Tsinghua students would pursue their individual expression in this style. This one shows ragged and rustic street men beautifully and brightly painted. Hammered metal 'Sunflowers' places patterns inside metal organic petal ellipses with downward growing, upside down roots mingling in this original composition with skulls and snails and clouds, rain and sun. Surrealism influences of Max Ernst abound in a gigantic triptych altar of atmosphere. The central panel is a Titianesque cloudscape in lurid neo-classic color tones, flanked by double panels in black with splatter nebulae. A world in a conch shell advances hyper surrealism beyond Dali to make this personal statement. Getting old is heck, I say. I've been bothered by some minor issues with my feet and finally realized I should try some traditional Chinese treatment. I wrote up a little description of my problem with personal details a doctor would ask about, went to Google translator and got it printed out in Chinese. Saturday afternoon around 3pm I biked over to Qingqi Fitness-- "Strengthening the body resistance, Treating both manifestation and root." "All the masseurs have the certification of senior masseur accredited by the nation." A nice older woman with a beautiful and interesting face gave me an examination. I saw her in photographs on the wall with various other people at a big dinner or conference. She checked my pulse as I rested my wrist on a little pillow and looked at my tongue. Standing, she checked pressure points along my spine and down the front.She had a friend interpret a bit, asked some more questions and moved me into the foot massage room. A half hour soaking in warm herbs, kneading of shoulders, toes, ankles, calves was followed by an extraordinary two hour experience in a private massage room by a different masseur. First he checked me standing, poking in various ingenious places. Although he couldn't speak English and I "Wo bu hui shuo hanyu," I understood he wanted to know if it was tender or sore where he was poking. He was very interested, looking in my ears, grunting with surprise "huh?" Next came a thorough manipulation and meridian/pressure point routine. He zeroed right in to my problem areas-- uneven shoulders and corresponding opposite hip, contrapposto as it were. I was breathing hard and squeaking when he got into a particularly sensitive point. That made him chuckle? He would rub his hands together for only a second and they would get hot. He would place them on me and bring heat to an area. Similarly, his finger tips felt like burning embers. Gradually I got the idea that he was moving the electrical current around my system by manual manipulation, moving it through blockages deep in my right hip and left shoulder blade. I have to be honest, there were a couple moments I might have blacked out. I won't kid you, IT WAS PAINFUL! They want me to come back on Sunday for further torture. If my body straightens out and my feet recover, it will be more than worth it. I will keep you posted. $250Y for 2 1/2 hours ($43) for Chinese therapeutic massage. As I'm sitting here working up the breakfast letter, imagine me listening to the Beach Boys on Jazz FM 88.5 KSBR Internet Radio from Saddleback College in San Diego, California. Anyone out there who knew me when I had my sweet (Little Douce Coupe) (taikule!) Supra 1988? Beijing Almanac: The sun rises at 4:45am up here in Beijing, and it sets at 7:42pm. There is no daylight savings time, and there is only one time zone for a country that is 3040 miles or 4892 km wide. Compare that to the US which has 3 time zones in the contiguous 48 states and is 2680 miles or 4313 km wide. Lately the temp has gotten up to 95 degrees F or 35 degrees C with lows in the high 60s or low 70s degrees F or 21 degrees C, humidity 20%. In Dunsmuir, CA today, by contrast, the high was 79 degrees F or 23 degrees C with a low of 52 degrees F or 7 degrees C and 87% humidity, its been a real rainy cold spring they tell me. In Dunsmuir sunrise is at 5:35am, about an hour later, and sunset is at 8:45pm, about an hour later, and there's your daylight savings time. I have an AC over the bed and another in the office. I prefer to sleep with a few windows open to catch a cross breeze. I only revert to the AC when I rarely hear a mosquito, they HATE the AC and go elsewhere. We had a tremendous thunderstorm the other night, hours-- or so it seemed-- of thunder like canon artillery, lightning like a strobe in my bedroom, and rain pouring down. Made me think of pictures I've seen of India during the monsoons. By morning clear sky with puffy clouds at the horizon and huge puddles. The whole weather impression more like Houston than New Delhi. Early in the morning, when the campus internet connection is turned off, my attention goes out the window. Below in the street the hutong is up and at it. A young man is walking his dog, carrying a scooper. The guard shack ladies are inspecting their flowers, tiny seedlings in a myriad of pots-- portulaca and marigold. Transplanting is going on, succulents like jade plant, no potting soil, just Beijing dirt. The many small wheeled traffic is weaving around pedestrians going to work. A long arching trail of water on the pavement where someone has carried a dripping mop around the corner from the bathhouse to their little hobbit room to mop the floor. The most interesting is the sewer repair going on all around the apartment. A survey team marked the areas with white chalk on one day. Since then, every day, they dig up a prescribed length of street, and install new flexible pipe about 10-12-inches by 20-feet. They fill it all in by the end of the day. Work hours are 7am to 6pm, 11 hours less time off at lunch. Ten men with square and spade shovels, sledge hammer, pick axe, individual tampers that look like fat post hole diggers. I am happy to see this work started. The dirt alley between rows of hutong houses that I can see from my living room has a permanent puddle, and of course we know what that means, chronic leak and health safety hazard. To make it through the day working consistently, they go in spurts 5 work while 5 rest, work, rest. Bricks and rocks are picked out and placed in a pile. The boss wears a panama straw hat, clean blue work pants and black shirt, his uniform. The workmen wear whatever, no gloves generally. He sets the pace and works a spell, then crosses the street and supervises from the shade, sitting and smoking or drinking from his thermos. At night the work site is a kid magnet for playing in the dirt. On Friday the workmen are setting big street pavers in mortar over the new sewer pipe. They use an X-shaped two-man grip to move and position the big pavers. On the other end of the project, two guys are installing a new sewer well. One man is in the hole, mortaring bricks in circles, going up. The other man mixes the mortar in the street-- no electric mixer, no power tools at all for this crew. He makes a pile of concrete, pours water into a depression from a large water can, then goes around in a circle, shoveling the dry into the wet. When the boss needs sand at his end, this guy stops and fills the big square wheel barrow for him. I have discovered an internet jazz radio station from San Diego. Is that distant thunder rumbling with a syncopated jazz beat? After dinner I took a stroll around the neighborhood. A tiny drop hit my foot a few steps from Puji, almost unnoticeable. Migrant men, cleaned up after a week of work, were hanging out on the corner. Some were huddled over ramen and 3.50 Y $.54 bottles of beer (pi jiu) in the dark next to the tiny neighborhood quick mart. All the construction going on in the street and major work at the nearby elementary school has been a bonanza for them. Blue shadows, gusts of wind, more drops, hurry home before the storm! I had my first language class on Friday. I have signed up for 50 classes, twice a week, that's about 6 months. They are one-on-one and cost 160Y each or $25 for two hours. Chen is letting me do this on my work week Mon and Fri 8-10 as long as I keep ahead on my work and they don't interfere with the job. ratatouille with Chinese characteristics, slow cooked in my electric wok with 3 kinds of peppers, cilantro and 2 kinds of eggplant. pan fried stuffed wonton with steamed asparagus, sauteed morels and sweet red pepper salsa with garlic chives, ginger over a bed of lettuce and grated carrot and sprinkled with toasted black sesame seeds. Yan Jiang, Chinese wife of Prof Mike from Chemistry dept (been here 11 years with 4 children!) brought homemade cherry cheese cake made with fresh cherries. My Chinese neighbor Dr ZHANG Wei Yong brought a big bunch of lychee and a big box of Dove chocolate. Sorry about all those pictures in the street of workmen. I'm just fascinated with the way things can get done here without a backhoe. I hope you enjoyed this as much as I have. We have a lot of pix this week. Monday I went downtown for the 10th time to pick up my passport. I saw some interesting vehicles on the busy streets. The most interesting one I didn't get a photo of, was a mule pulling a cart of melons right downtown. I made it up for you with a mule pulling a cart of bricks on the highway near Phoenix Hills. There were six of these brick carts. Back to the passport, this time I graduated from Tourist Visa L to Resident Permit, although only for 2 months. Now all that has to be done is to obtain my FE ID card and then I will be able to apply for a 1 year resident permit. Gasp! Want to hear a funny story? The first time I went downtown I was turned away in a few seconds by a DORCGB (Darling Old Red Chinese Government Bureaucrat) who frowned at my pathetic, incomplete and incorrect paperwork. This was in mid April. Last week on the last difficult step of the process, I ended up at her window again. She critically examined my docs, gorgeous ones with lots of red characters and impressive red stamps from Tsinghua on heavy parchment, requesting processing in Beijing instead of making me go all the way to Hong Kong. This is a veryunusual request, perhaps a request which has never been granted or darn rarely. She glumly gathered up my papers, passport, tiny headshot pictures, and carried all this into the back, presumably where her supervisor would have to make a decision. Well, she returned with the approval we were all anxious to receive, stamped my receipt, and I think I saw a tiny smirk of a approval. She LOVED my paperwork! Something a DORCGB could respect, gorgeous red lettered paperwork all in order and from 'top' levels. Funny, don't you think? Wednesday Chen took us all for an outing to Phoenix Hills to the north of Beijing in Haidian District. It is 15K or 31m from Tian'anmen Square or 23k or 14m from Tsinghua. This was a reward for all the good work and long hours we put into the Centennial last month. We pulled off the freeway and got onto a big highway, following big brown signs. This route was being taken by the President of DPK (SKorea) same day, we kept seeing police at every intersection. After several miles we turned onto a two lane road that ran by the old canal and past big commune farms. It was cherry season and farm stands were everywhere with cherries, fresh eggs and melons under red umbrellas. Finally we got to a little town, NieGeZhuang, threaded our way to the other side and started climbing elevation. Suddenly, looming out of the smog, the big rock formations could be seen. "Grotesque peaks, queer rocks, vast forests of pine, ginkgo, peach, apple and apricot, and mysterious springs." Surrounded by rich farmland, this is the location of Longquan Buddhist Temple, built 951CE and named for the Dragon Spring on the site. Built in the style of the Liao (907-1125) and Jin (1115-1234) Dynasties, it features the oldest stone bridge in Beijing, 1,000 year old male and female ginkgo (gongsun) trees. The original temple was destroyed during the Cultural Revolution in the 70s. Now signs of construction are everywhere. Before this site was Buddhist, it was used by ascetic Taoists in their search for peace and immortality. Many caves here, 'Immortal's Cave' 'Three Buddha Cave' 'Xuanyuan Cave' and more, all hermit caves used for millennium. Now the current spiritualists blend Buddhism, Confucianism and Taoism. A multi lingual Dharma Assembly was held during Lantern Festival this year (2-28-2011), the first event of its kind in China. Sutras were chanted in 13 languages, Chinese, Tibetan, English, German, French, Japanese, Korean, Spanish, Sanskrit, Russian, Vietnamese, Latin and Pali. Up up up we went past rose gardens of every hue and fragrant. Through the portal guarded by fierce deities, and we were in the temple grounds proper. Still up up up, crossed a dry creek on the old Golden Dragon bridge, up up up wide stone steps and stairs past the new reconstructed temple building, the monks vegetable gardens, up up up great views, I almost passed out from vertigo at the hermit cave. Still up a little more before we looped around and got a group picture at a picturesque pavilion. We only saw a tiny fraction of the place, but I was happy to get down and we prowled around looking for some place to eat. Mid week, no crowds, only customers in huge restaurant, many dishes including stewed whole lake fish. Everyone played with the puppies in the courtyard as we inspected remnants of a working farm now converted to tourist trade. As if that wasn't enough fun, we stopped at a u-pick and tramped around in a cherry orchard, city folks enjoying themselves for the day in the country. I was shocked to see mule drawn wagons on the highway pulling loads of bricks. Chen pulled over, and I sprinted in the sweltering heat back across the intersection in time to get a few good pix. I finally got the Beijing hay fever from all the wind, dust, pollen blowing around. Discovered the yaodian, pharmacy, next door to the little market and bought some asipilin, aspirin. I examined the package carefully, and it looks like genuine Bayer but big effervescent tablets with some vitamin C, a great way to take aspirin! Box for 22 Y or $3.38, not cheap. The store smelled like Chinese herbs, ginseng, clean and brightly lit with pairs of pleasant sales girls behind every counter. They fill out a slip which you take to the cashier and bring it back stamped 'paid' to pick up your purchase. Sitting on the grassy hill next to the office, I see small clumps of students under the wisteria pergola. A boy is playing a guitar and the others sing along. Big rain birds are lazily spouting arching streams of water. Fashions: red silk pajamas, shorts with flesh colored leggings and medium high heels, lots of long swirly skirts on the young girls with the warm weather. A man smoking a cigarette is caught between rain birds and can't go forward or backward without getting his taupe gabardine trousers wet-- they just banned public smoking throughout China. Young girls run through, screaming and giggling wearing french t-shirt and jeans with glitter on the back pocket on one, short ruffled pink dress with tie straps on the other. Not too many hats or parasols today cause a little overcast but hot and spring like. On Friday it sounded like squadrons of B52s over Tsinghua-- reminiscent of old WWII movies-- this went on for about 45 minutes. They had sent a squad of grounds keepers to our little park to mow and blow! Down the hall on or floor they are installing a farm of Dell processors in a room they have been preparing for weeks. The hallway is littered with big Dell and A/C boxes, copper coaxial cable, tool boxes and stuff. I am labeling data in my gigantic excel spreadsheet comparison of 7 each universities from US , Asia , China and Europe . A mindless task that allows me to mull over the data as I click and tab through the 100s of fields, thinking about formulas, the implications, the similarities and differences. The new spreadsheets these days are pretty with colored schemes to help organize the columns and rows. When I first moved into my apartment I was amused to find a booklet describing my place for "visiting scholars," so that made me a "visiting scholar!" Now I know a little more about the complex roles here. Altho I am a FE that doesn't make me a VS. While riding to the little shopping center with Monica, we passed an Asian guy who waved at us. She tells me he is a VS from USC who is a full professor there but he visits Tsinghua a few times a year, staying several weeks at a time to supervise doctoral students at Tsinghua. Monica also tells me about her own supervising professor who earned his doctorate in the US years ago. He comes to TU every 3 months to check on his research fellows like Monica. She is post doc and consequently her supervising prof is of higher stature than those supervising the younger, lower doc candidates. So, these "visiting scholars" need somewhere to stay, but only for a short while, until the next VS moves in for a shot visit, and so on. The university is eager to attract quality VS and send recruiting agents around to "top" foreign universities to find them. Once here, they lavish them with perks such as a really nice apartment like mine-- really nice by TU standards. Today, Saturday, I worked on my computer at the office, adding drop down windows to the menu on my new website and doing some housekeeping on my Peony Pavilion video. Lunch was Thai curry pasta 18Y or $2.77 and Americano caffe 14 Y $2.15 at the Times Cafe near the office on the ground floor level of the big student/staff canteen, filled with young people. On one corner of the library is an ancient garden built up with beautiful rock, winding paths, small hill covered with gaunt pines and junipers, winter withered bamboo groves, just now pushing out small green spears. On the grassy area a flock of hutong ladies worked their way across like geese, heads down and tushies in the air, digging dandelions out by the root and stuffing them into shopping bags, later to be transformed into a tasty meal. Nearby is another park with a fantastic rock called Ling Xi Shi. Ling: quick, departed soul Xi: sharp, rhinoceros Shi: Rock. Lady Xi Ling Shi was the 14 year old bride of Emperor Huang Ti, "Yellow Emperor," a legendary founder of Chinese civilization from 2697-2597 BCE. Lady Xi invented silk weaving while sipping tea. A silk cocoon fell into her cup. While she watched the delicate fibers unravel in the hot liquid she was inspired to try using it to create yarn for weaving. What do things cost category: Package needles, large spool thread, several yards ribbon 2Y or $.30, tube superglue 4Y or $.60, 1/2 small hot house watermelon 13Y $2.00. Met an interesting young woman at the on campus coffee cafe. After studying in Belgium, she has returned to China to do more studying. Although her major is Chinese literature and language, she is transitioning to anthropology. And another thing, she is the research assistant for Sara you will be hearing about later in this letter. Her name is Li, and she is very knowledgeable about the hutong neighborhood where I live in my Puji apartment building. She tells me the little tony internet cafe down my way used to be the residence of two famous people, husband and wife. She, Lin Hui Yin, an architect and writer, and he, Liang Si Chen, an architect. Lin Hui Yin (1904-1955) first female architect in China, at age 16 met Xu Zhimo, poet, in London and they started an affair. He asked for a divorce from his wife, but Hui Yin ended up marrying another man Lian Sicheng. Zhimo never stopped loving HuiYin, and this is a famous 20th century Chinese love story. 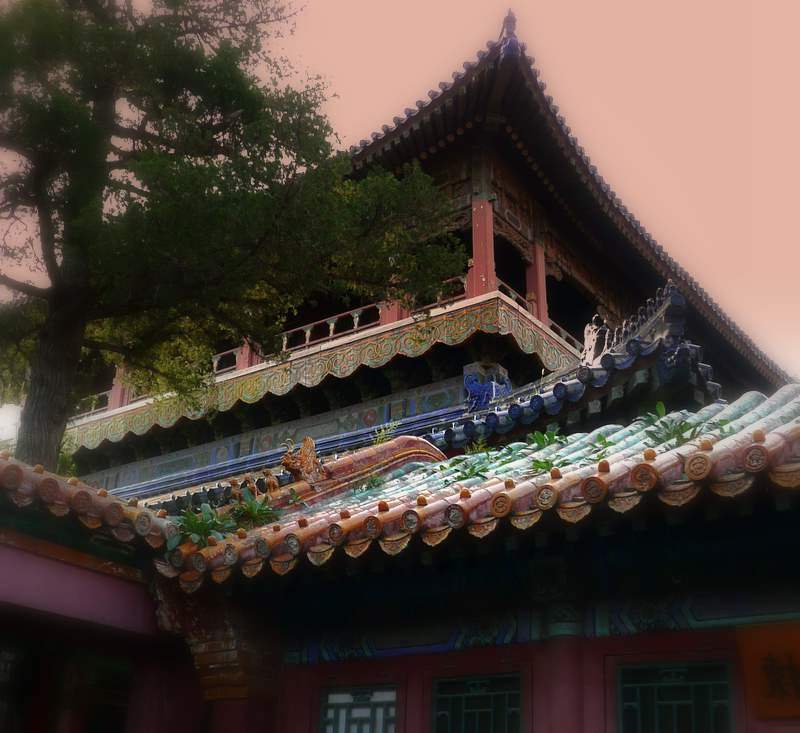 In Jan 2010 the former residence of Liang Sicheng and Lin HuiYin, located in Beizonghu HuTong, Dongcheng District, Beijing, was been declared an "immovable cultural heritage" and is now protected. Now you can have very expensive coffee 28Y $4.31 in a casual artsy setting, supporting a good cause, where waitresses suddenly pick up a guitar and start practicing and a tiny homage to the two famous residents is decorated with flowers and photographs. Some of you have requested food pix, so here we go about food again For lunch we meet at the Main East Gate and walk to a bustling commercial district just off campus, the waitress knows us and we get a good table by the window. The waitress takes our order right away, guiding us through the beautifully photographed menu, recording everything on a little hand held device. You pay right then. For four of us, four dishes, rice, a big bottle of beer (pi jiu) + four little glasses came to just under 80Y $12.31, easy to split 4 ways. We got an egg dish with flower buds, eggplant with sweet red and green peppers, spicy mapo tofu and a new one: eagle claw peppers which we all agreed were very like Chinese chile rellenos, delicious. Lately they've been checking ID's of people coming onto campus. I've been here three months and have never had to show my ID to anyone, and a good thing cause I don't have one. I've been hearing stories of people being refused entry, and I see them really scrutinize the cars coming in. James the cab driver has a placard he displays on his dash that lets him in cause he lives in the hutong. It's gold apparently. Approaching the gate, we discuss our strategy. Sharon and I blithely breezed past the young guards, not looking at them and talking to each other. Monica and Sara flash their ID's behind us. I conveniently can't hear or understand the guards talking to the back of my head. Somehow I've gotten in again no problemo. I'll be happy to have a decent ID soon. In the accompanying pix you will find a picture of a chinese magpie, a symbol of happiness, xi que. Chinese agave (aloe) long she lan shu zhi wu is used for perfume.